June 2018 18 www.sportseventsmagazine.com ONE- on- ONE t Director of Operations Ashley Ellefson. We plan every race from start to finish, discovering fascinating locations, walking through what we think the course line could be and imagining thematic installations we could develop to create an outer-world vibe inspired by the venue. We sketch out our track ideas that we transform into 3-D maps to help us build out the real-life, complex racecourse. You've taken this hobby to a professional level. What's involved in taking an idea like this from a small event to something that is watched by millions of people around the world? It truly takes a village. 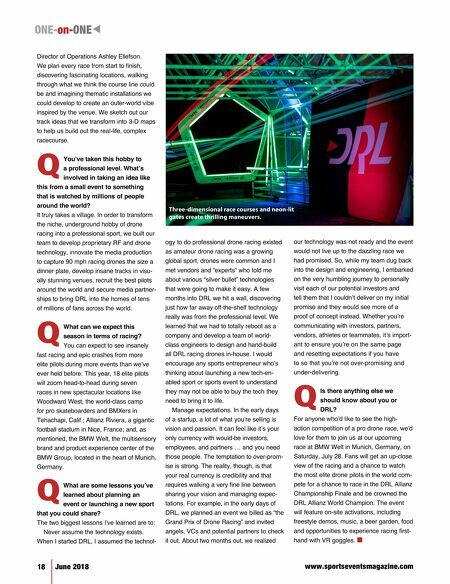 In order to transform the niche, underground hobby of drone racing into a professional sport, we built our team to develop proprietary RF and drone technology, innovate the media production to capture 90 mph racing drones the size a dinner plate, develop insane tracks in visu- ally stunning venues, recruit the best pilots around the world and secure media partner- ships to bring DRL into the homes of tens of millions of fans across the world. What can we expect this season in terms of racing? You can expect to see insanely fast racing and epic crashes from more elite pilots during more events than we've ever held before. This year, 18 elite pilots will zoom head-to-head during seven races in new spectacular locations like Woodward West, the world-class camp for pro skateboarders and BMXers in Tehachapi, Calif.; Allianz Riviera, a gigantic football stadium in Nice, France; and, as mentioned, the BMW Welt, the multisensory brand and product experience center of the BMW Group, located in the heart of Munich, Germany. 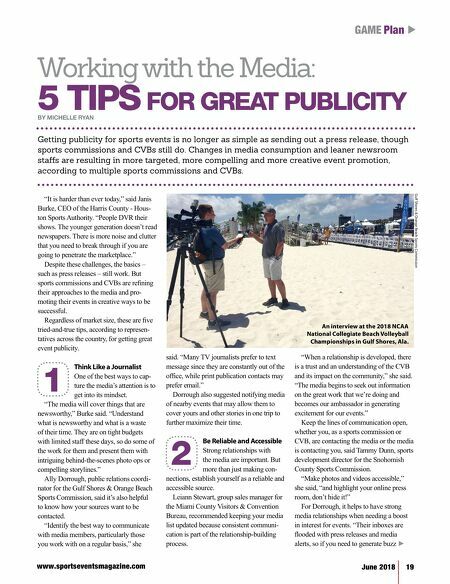 What are some lessons you've learned about planning an event or launching a new sport that you could share? The two biggest lessons I've learned are to: Never assume the technology exists. When I started DRL, I assumed the technol- ogy to do professional drone racing existed as amateur drone racing was a growing global sport, drones were common and I met vendors and "experts" who told me about various "silver bullet" technologies that were going to make it easy. A few months into DRL we hit a wall, discovering just how far away off-the-shelf technology really was from the professional level. We learned that we had to totally reboot as a company and develop a team of world- class engineers to design and hand-build all DRL racing drones in-house. I would encourage any sports entrepreneur who's thinking about launching a new tech-en- abled sport or sports event to understand they may not be able to buy the tech they need to bring it to life. Manage expectations. In the early days of a startup, a lot of what you're selling is vision and passion. It can feel like it's your only currency with would-be investors, employees, and partners … and you need those people. The temptation to over-prom- ise is strong. The reality, though, is that your real currency is credibility and that requires walking a very fine line between sharing your vision and managing expec- tations. For example, in the early days of DRL, we planned an event we billed as "the Grand Prix of Drone Racing" and invited angels, VCs and potential partners to check it out. About two months out, we realized our technology was not ready and the event would not live up to the dazzling race we had promised. So, while my team dug back into the design and engineering, I embarked on the very humbling journey to personally visit each of our potential investors and tell them that I couldn't deliver on my initial promise and they would see more of a proof of concept instead. Whether you're communicating with investors, partners, vendors, athletes or teammates, it's import- ant to ensure you're on the same page and resetting expectations if you have to so that you're not over-promising and under-delivering. Is there anything else we should know about you or DRL? For anyone who'd like to see the high- action competition of a pro drone race, we'd love for them to join us at our upcoming race at BMW Welt in Munich, Germany, on Saturday, July 28. Fans will get an up-close view of the racing and a chance to watch the most elite drone pilots in the world com- pete for a chance to race in the DRL Allianz Championship Finale and be crowned the DRL Allianz World Champion. The event will feature on-site activations, including freestyle demos, music, a beer garden, food and opportunities to experience racing first- hand with VR goggles. n Q Q Q Q Three-dimensional race courses and neon-lit gates create thrilling maneuvers.